We are all familiar with scrap as a load for open-top cars, usually gondolas. Scrap could be generated in a wide variety of manufacturing plants, and because it could readily be re-melted, had commercial value. Thus observing railroad traffic, for example in yards, would often reveal cars of scrap going and coming from all directions. 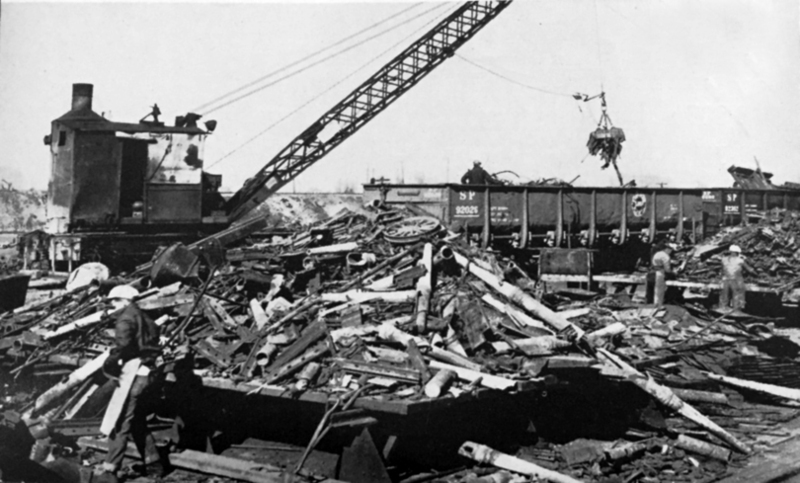 Scrap was described by a grading system, and carloads of a single grade, for example, Grade 1 Heavy Melting Scrap, were of course worth more money. 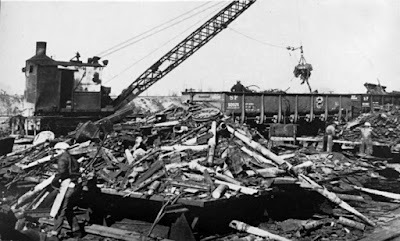 If carloads of a single grade weren’t possible, a shipper would at least strive to have carloads of all steel scrap, or all cast iron, or aluminum, or whatever they worked with. But even mixed scrap had value. Scrap was also an important traffic component, for any railroad with a major car shop. Repairing, upgrading or rebuilding cars naturally generated scrap, particularly when hundreds or even thousands of cars might pass through a particular shop in a year. Some railroads simply sold this scrap commercially, but those with the ability to recycle it, either by reclaiming individual parts or by remelting to make castings, would collect it from across the railroad. 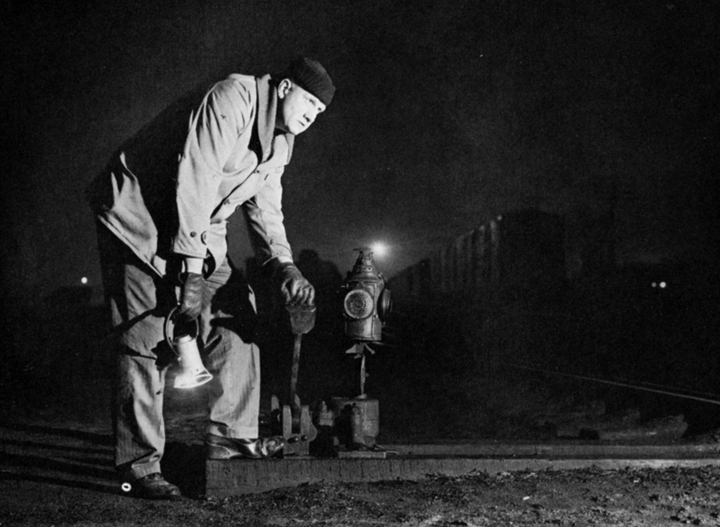 As a single example, Southern Pacific, possessed of several major car shops across the system and with a major reclaim operation at Sacramento, along with a foundry and forge shop, collected immense amounts of scrap annually. This was described from time to time in the employee magazine, the Bulletin. Shown below is a typical photo from the Bulletin. 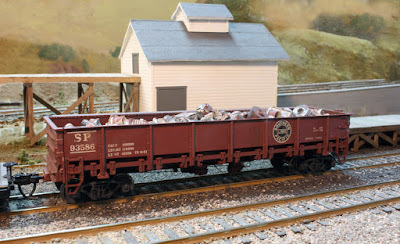 One of the vendors offering much more realistic loads nowadays is Motrak (visit their website to see lots of examples; they are at this link: http://motrakmodelsusa.com/categories.html#!/~/search/category=20386258&fieldScale=H%20Scale&fieldCategory=Freight%20Car%20Loads ). They have more than 15 screens of loads for a truly wide variety of HO and N scale manufacturers’ hoppers and gondolas. They are primarily coal, gravel (ballast), ore, scrap metal, scrap aluminum, and woodchips. Most are made from Hydrocal plaster, some are resin. Shown below is one of the scrap aluminum loads at bottom; above it is the Chooch load shown in the photo above. But you may need something different, or just not want to spend the money. Loads like this are easy to make yourself, using whatever kind of base you like for loads. I usually use sheet balsa, because my open-top cars are weighted to operate properly when empty, thus do not need any more weight in a load than absolutely necessary. I have rummaged around in my “too good to throw away” miscellaneous-parts drawer and chosen stuff to glue onto scrap loads. 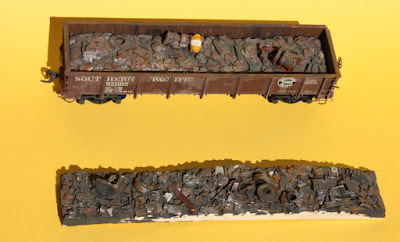 In the photo below are a bunch of those miscellaneous parts, most painted a rusty color to suggest old scrap, but ranging from orangish-brown to dark brown, all on a balsa base sized to the destination car. I also modify commercial loads, as I mentioned above. I show next two older Chooch loads that have had items I didn’t like carved off, and others added. Both are painted fairly dark to look like old scrap. The upper one is in a Details Associates gondola, for which it was cut to fit. I decided to paint one of the items of scrap, a yellow and white barrel, to make the rest of the load less interesting to examine. These are simple loads, either to buy or to make. They can offer immense variety in appearance, so can serve as a wide variety of cargoes to and from different industries. On my layout, I will probably add more loads to the group shown here (and a couple not shown). I believe that variety in loads is always my friend. I was sent an interesting question following a prior post. Andy Love asked about how my newer waybills have affected the process I use to handle waybills. 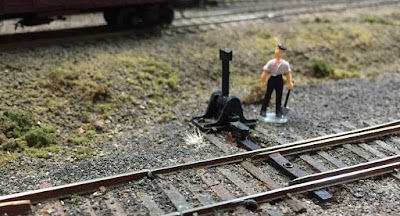 (You can read his comment at the end of an earlier post, at: https://modelingthesp.blogspot.com/2016/11/waybills-part-55-article-in-dispatchers.html .) I have touched on this point in prior blog posts but perhaps never presented the full description of how I do that work. 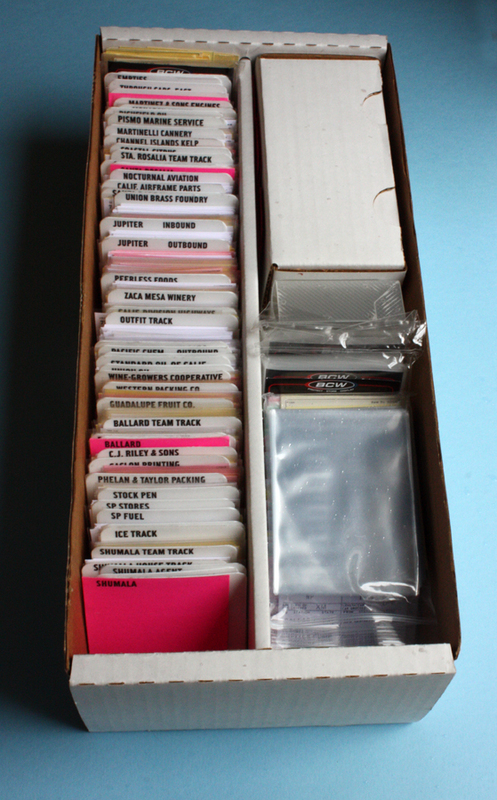 Andy’s first question was whether I still use the same plastic sleeves (baseball-card collectors’ sleeves). I do, partly to protect bills in handling, because I do re-use them, but also to permit pairing loaded and empty (or loaded and loaded) paperwork in that sleeve. The sleeve also permits use of “overlay” or short bills. I discussed those at modest length in previous posts, starting with this one: http://modelingthesp.blogspot.com/2011/08/waybills-10.html . That basic idea has been extended in other posts, but perhaps most clearly here: http://modelingthesp.blogspot.com/2015/06/waybills-part-41-overlay-bills.html . I do use these overlays often, especially for my outbound perishable loads, which all are moved on Southern Pacific waybills and thus have a common header. The overlays, among other things, allow me to consistently ship seasonally-correct produce in operating sessions (see for example: http://modelingthesp.blogspot.com/2015/09/seasonality-of-crops-and-traffic.html ). But the overlays do not “live” in the sleeve. Instead, they are stored by industry (more on that in a moment). Andy also asked if there are multiple waybills for each car. Certainly for some cars, there are, but others have essentially singular application (such as a Union Oil Company tank car delivering to a Union bulk dealer) and could not readily support two or more different waybills. Free-running box cars, of course, are almost the opposite, and could in principle have many, many waybills each, though I have not followed through to make anything like those kinds of quantities. But any multiple waybills are generally not stored together in a single sleeve for a car. Let me explain. My core waybill management is by industry. So any car with waybills to or from more than one industry needs to have those bills separated. That’s because my whole management of car flow within and between operating sessions is a demand system, as I’ve outlined previously (see for example this post: http://modelingthesp.blogspot.com/2011/11/operations-demand-based-car-flow-2.html ). Accordingly, I file all waybills by industry in a single box (you can click on the photo to enlarge it). The town dividers are the bright magenta cards that you see above, with separate industries between them. The right half of the box is just materials storage. This box, incidentally, happens to be a file box designed for baseball cards. These are available from several suppliers; I use BCW (visit them at: http://www.bcwsupplies.com/products/corrugated-storage-boxes/ for more info; there are four pages of box listings). They call it a “Shoe Storage Box,” and it is indeed reminiscent of a shoe box. It also has a lid (not shown). Any overlay or short bills are also filed by industry. My key “finding aid” for these waybills is a computer list, also organized by town and then by industry, much as you see in the bill storage box above. I call it a “pairs list,” because it lists pairs of load origins and destinations. I attempted to explain this, and how it works, in a post some time back (you can read it at this link: http://modelingthesp.blogspot.com/2012/02/waybills-17-pairs-list.html ), The example shown in that post was for Otis McGee’s layout, for which I first developed the idea, and now I maintain such a list for my waybills as well as the one for his layout. Shown below are a few selected entries (not complete for any of the industries, but chosen to show examples only). Here again, you may click to enlarge. Entries within each industry are in order by AAR car type, then by reporting marks. Note the overlay bills, listed as a “half” here. The column of entries in parentheses lists the location of the original file for each waybill. This being an electronic list, it is quickly and easily searched, for example by car number, or by reporting mark if I want to find all cars of a particular ownership, or even by AAR car type if I want to find, say, all the covered hoppers (AAR type LO). I can then go to the physical file box and pull the desired waybill(s). 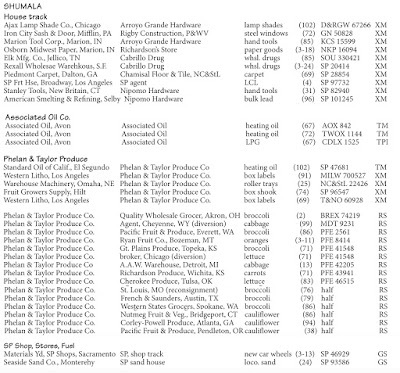 Even this modest sample of my pairs list should answer Andy’s last question, whether there are multiple waybills to or from any particular industry. There certainly are! Some, like the packing houses, are predominantly outbound; others, like manufacturing businesses, may have a balance of inbound materials and outbound products; and a wholesale grocer, like my Peerless Foods, has only inbound loads (over 80 at last count). I know from inquiring at many visited layouts over the years, that every layout owner evolves a method of accomplishing car flow, managing car cards or waybills, and storing and retrieving the cars themselves from storage. What is described above is just one such approach, one that I’ve found to work for me. In the previous post in this series, I had completed the Design Preservation kit (no. 103, “Cutting’s Scissor Co.”) that I chose as the structure for my chemical repackaging business (such businesses are described in my first post on this topic, which is at: http://modelingthesp.blogspot.com/2017/02/a-chemical-repackaging-business.html ) and had applied vinyl spackle to it to represent a stucco building. Progress to that point was shown in the post for Part 2 (you can see it at: http://modelingthesp.blogspot.com/2017/03/chemical-repackaging-part-2.html ). Once the building had been airbrushed with Floquil “Earth,” I brush-painted the window frames and doors with a dark brown color similar to “Roof Brown.” I then painted all the sills and lintels of the door and window openings with Floquil “Concrete.” When a stucco building is painted, such parts may or may not be included in the painting, and I chose to show them as unpainted. This gave a fairly nice looking building, in my opinion. Next I wanted to add a sign for the business. 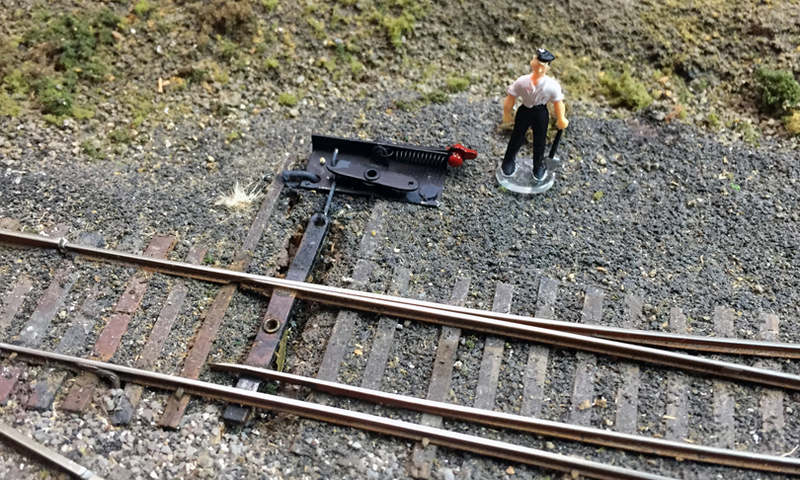 Not every prototype business sports a highly visible sign, but on my layout I want operating crews to know exactly what they are doing, to the extent possible. Making industry identification unmistakable is one contribution to that. The sign was then cut out and attached with canopy glue. 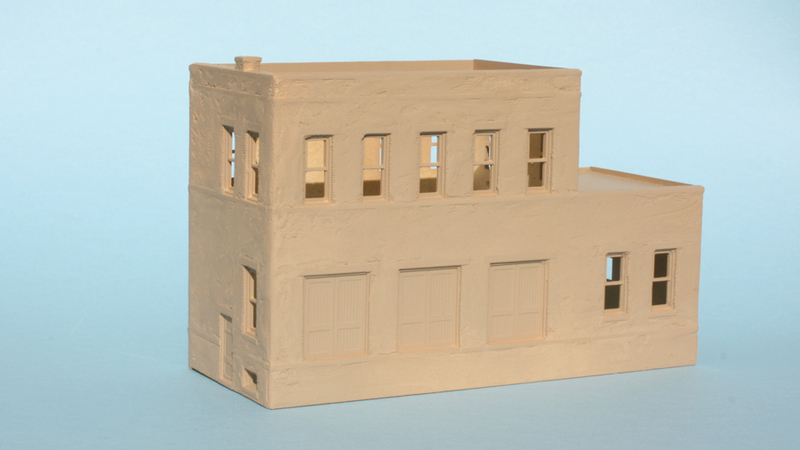 Here is the building, as developed up to this point, in its approximate arrangement on the layout at Ballard. 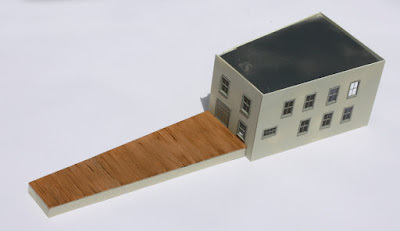 I have added a rooftop tank, a resin piece from a Chooch tank set, resting in scale 4 x 12-inch timbers. I still need a few additional details to complete this structure, but this shows the present state. Note also the miscellaneous collection of storage tanks, deliberately differing in color. I have not yet made the final arrangements on those parts. 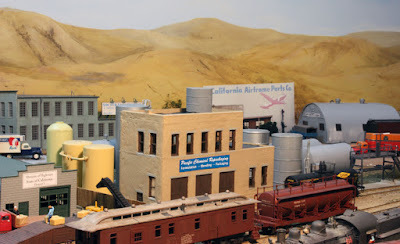 I now have an interesting industry in model form to accept inbound loads, especially from tank cars, and also to load outbound cars with a variety of products. Chemical repackaging is a versatile and wide-ranging type of business, which I think could serve the same purposes on many layouts. It also has the great modeling advantage that it need not be a massive industrial complex. 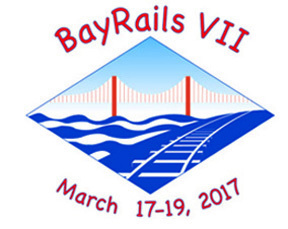 Among the 40 or so operating weekends that are held around the country is our local one here in the San Francisco Bay Area, called BayRails. It is offered in March of odd-numbered years, and this year was the 7th time it’s been held. The organizing committee of Seth Neumann, David Parks, Ray deBlieck, Jim Providenza, Ed Slintak, Paul Weiss and Larry Altbaum did an excellent job once again with all the arrangements. 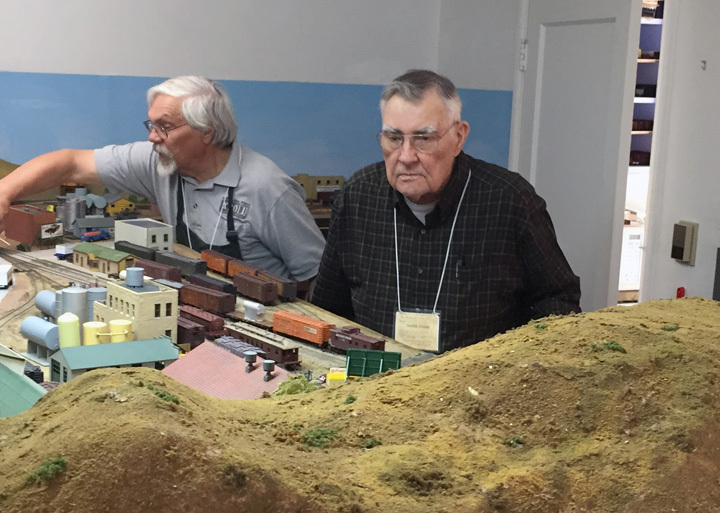 There were 24 layouts operated, and around 60 visiting operators. BayRails is officially an “invitation-only” event, but anyone can request an invitation through the website for the event at: http://bayrails.com/ . For the first time at a BayRails, my layout was among those scheduled for operating sessions. I had a pair of two-person crews on two different days. My sessions were generally similar to previous sessions, though there were a few new wrinkles in switching patterns. As always on my layout, seasonal produce shipping was represented, appropriate for March, and involved express reefers this time. The layout generally ran well, though there were the inevitable small glitches here and there. Crews seemed to enjoy the switching challenges and worked steadily through the assignments. I won’t show all the crews doing all the work, but just representative photos. On Friday, March 17, my crew was Jason Hill, Al Frasch, Dave Clune, and an old friend, Gordon Geiger. Gordon and I are both retired metallurgists and have know each other for many years. It was definitely fun to have him operating on my layout. He formed a crew with Jason, and here are the two of them at Shumala. I apologize for taking the photo just as Gordon, at right, was asking a question. Jason, who is the conductor in this photo, is also someone I’ve known for years, and having both of them here was a treat. While those two worked at Shumala, Al and Dave were switching at Ballard on the other side of the layout. That’s Al reaching for a ground throw at left while Dave studies their next move. You can see in this photo what I can report was indeed present, a real sense of fun in working the switching problems they were given. I greatly enjoyed hosting two days' worth of operators at BayRails this year, and hope to repeat that pleasure at future events. 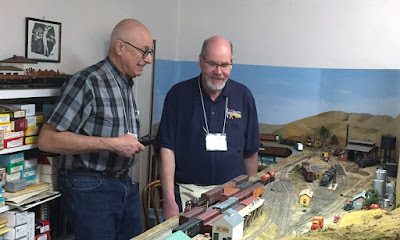 Moreover, preparation for the event was the stimulus for me to extend construction in a couple of areas of the layout and to fix some existing problems; and not only that, the operators who were here, experienced all, had some very insightful comments and suggestions. I certainly learned a few things and have some new goals for the future. I know the visitors enjoyed this event, but it was very enjoyable and valuable for me too. This structure could just accommodate two reefers at a time for loading, so that helped keep switch crews busy. The small structure at the right of the photo is the yard office. What then happened wasn’t recognized at first. 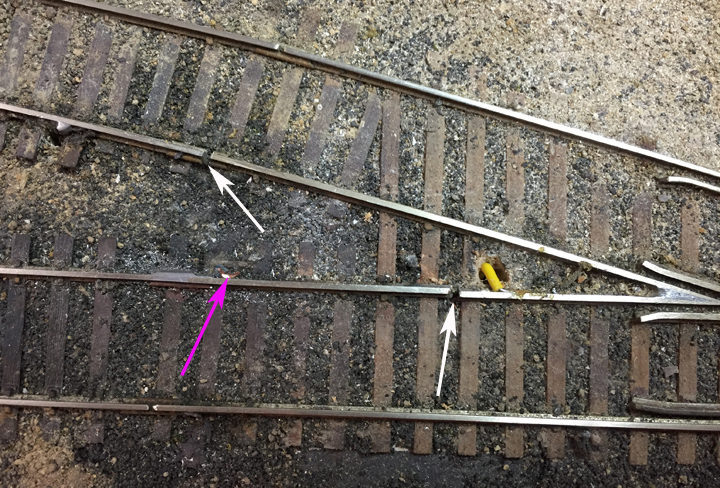 I decided to improve the wiring in this whole area of the layout, by isolating all turnouts and then separately feeding all track between turnouts (as I described in a post in 2012: http://modelingthesp.blogspot.com/2012/09/electrical-wars-part-2.html ). This minimizes the role of turnouts in power routing, for one thing. I designed the new feeder locations carefully, installed them all, and then went back and cut all the new gaps that were needed. This was all fine, or seemed so. because, as I realize in hindsight, I was not very actively switching on the back track at Associated Oil. Very occasionally I would think of doing so, and would get a short, but since it wasn’t important at that moment, I let it go. “Must be something simple, it always worked before; I’ll fix that one of these days,” is the kind of comment I would make to myself. But when I got a little more serious, preparing for the BayRails operating weekend in recent days, I thought I surely could fix this little problem simply. But the short when the turnout was placed in the reverse orientation was stubborn. All gaps were clean, all power feeds in the right place — or so it seemed, as I checked and re-checked against my wiring notebook, where all electrical work and modifications are recorded. This turnout had its frog powered from a slide switch, thus electrically dependable, or should be. Suddenly I noticed that this particular frog wire was on the wrong side of a gap! The frog wasn’t being powered from the slide switch at all! I must have just missed the correct location when cutting that new gap. At least it was an easy fix. Snip off the feeder to the wrong place, re-locate and solder the same wire to the correct place. When done it looked like the photo below. 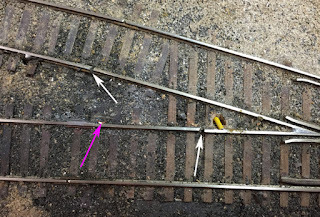 The two gaps are indicated by the white arrows, and the purple arrow shows where the wrong frog wire went. The new frog wire, with yellow insulation, is obvious. With this change, the problem entirely disappeared. I of course promptly painted that yellow wire a dark brown color to hide it. Though the eventual fix for my problem was easy, it was the devil to diagnose, as can easily happen with layout electrical problems. And in a way it was made worse by the existence of a wiring notebook, with careful sketches of exactly how the wiring changes were designed. Everything as written was impeccable. It just turned out that it was the implementation that was defective. Well, at least it’s a problem solved and maybe a lesson learned too. In the previous post (see: http://modelingthesp.blogspot.com/2015/05/building-guadalupe-fruit-part-3.html ), I showed the basic building assembled, though without windows installed or any detailing. In this post, I continue to work on completing the building, adding a number of components. The temporary Bristol board roof stiffens the structure, but is not the final roof. Since the final roof will be removable, something else is needed to create more structural stiffness below the roof. I installed a floor between the two rows of windows. 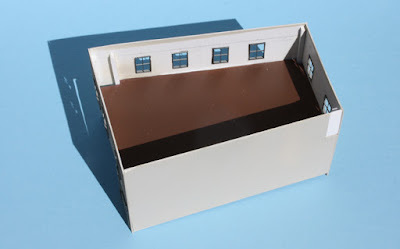 To do this, I glued 1/8-inch square styrene strip along the long walls, inside, to serve as floor supports. The floor also serves as a view block (preventing seeing first-floor windows through the second-floor windows.) Before installation, I painted the top of the floor with Tamiya paint TS-1, Red-Brown, a nice wood color that I use a lot. In the photo below, you can see the floor fitted into the structure, with the roof removed. 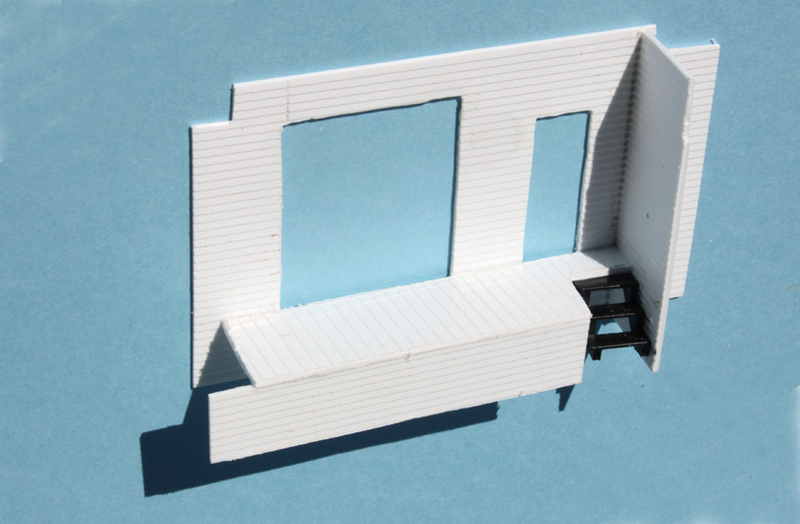 And yes, the rear wall, that faces away from the layout edge, has a small patch and no windows. The building also needs a sign to designate the industry name (helpful for visiting operation crews). I gave some thought to using decal letters, to give a “painted-on” look, but the sharp edges of the styrene clapboard siding made me worry about how decal manipulation might work. I decided instead to make a separate sign board, using styrene sheet and framing it with scale 1 x 6-inch styrene strip. I simply printed out the name at a size that would fit the signboard. The next part of the project was the truck-unloading dock, on the right-hand side of the photo above. I planned this truck dock as an inset into the end of the building, for which, so far, I had only left an opening. It is shown in the photo below. Note that corner trim strips have not yet been applied; I was waiting to see how they would work around the truck dock. To build an insert for this opening, I decided to use the same clapboard sheathing appearance as for the rest of the exterior, using Evergreen sheet no. 4051. This inset was designed so it could fit right into the opening in the building. Since the doors on this truck dock will not be very visible on the layout, being inside the inset, I decided that I didn’t need Grandt Line or other detailed model doors, and chose instead to just make appropriate size openings in the new wall and put V-groove sheet behind the openings. I then painted this entire assembly the same color as the walls of the structure, Testor’s “Flat Aircraft Light Gray,” no. 1233, though you can see that the color is closer to cream than to gray. I could then paint the deck an aged wood color, and make up separate doors to be painted “Flat Aircraft Dark Gray,”no. 1226, the trim color of the rest of the structure. I still have work to do on the roof and of course, the corner trim strips, but this building is now much more complete looking. It will serve well in my next operating session. Kathleen used drywall compound, a material that is easy to work with, and I have experience with it myself for other tasks. 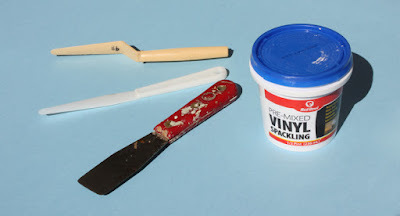 But not having any on hand, though wanting to try a stucco building, I rummaged around in the garage and found a container of Red Devil premixed vinyl spackle. 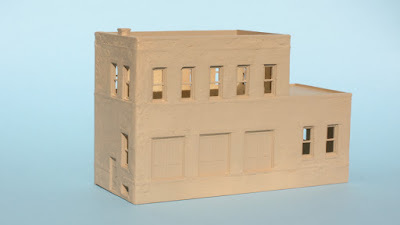 This material spreads smoothly and sticks well, so I thought I would try it on my styrene building (shown in the first post), which, like Kathleen’s, is a Design Preservation kit. I have a range of tools that I thought would be useful for this project, and I ended up using all three. One is a conventional putty knife, but worn from years of use so that it no longer has sharp corners, and the working edge tapers almost to a sharp edge. We have a new one for home repair projects, but I often use the old, worn one in the layout room. To that I added a couple of palette knives, some sort of plastic, that you can find at any art store. They have the advantage of a much narrower tip than the putty knife, and are more flexible. Kathleen suggested waiting 24 hours to dry completely, which might be a good interval for drywall compound, but this vinyl spackle package recommends two hours. That was ample, and in fact I would caution that you should not delay in cleaning any excess in window openings, etc. Once it was dry, I used some 100-grit sandpaper for less than 5 minutes and removed practically all the irregularities. Careful examination of the “stucco” at this point, with illumination at an angle, did reveal a few places where the surface was uneven or pits or bumps were evident. I made a second application, this time using a narrow applicator, to take care of all these problems, then sanded again with 100 and 220 grit paper. Although one could doubtless obtain a truly smooth surface with this spackle, as one would do in home repairs, I decided not to do that. This particular industry is over a foot from the edge of the layout, and I thought it desirable to leave some irregularities that could be noticed. 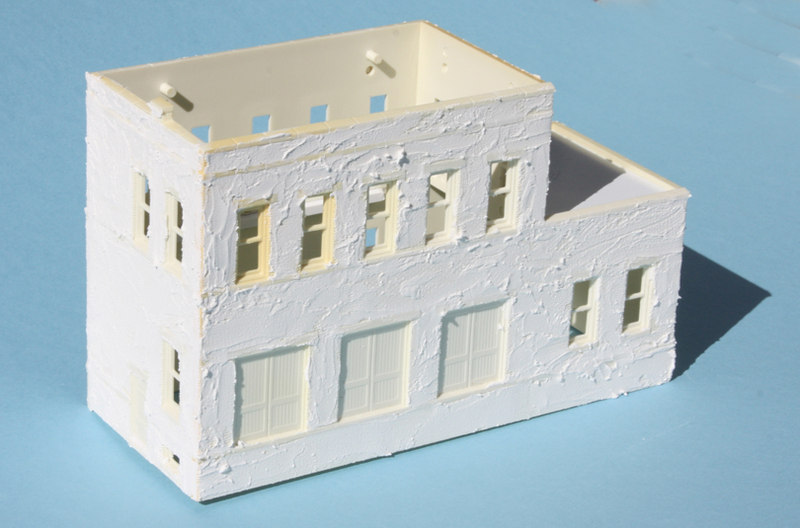 Of course the texture of prototype stucco is far below the the threshold of visibility in HO scale, but I wanted to suggest that kind of surface. 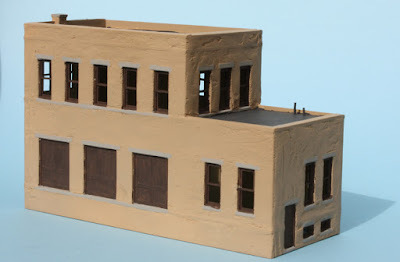 Having looked at prototype industrial buildings with stucco exterior, and found a number of historic photos on line, I chose to go with a tan color. Rummaging around in my collection of old Floquil paint, I found a bottle of “Earth,” which seemed to have about the tone I wanted. I went ahead and airbrushed the structure with that color. The photo below shows the structure at this point. It still needs the sills and lintels painted a concrete color, and of course roof coloring. The window frames could be gray or perhaps brown. I haven’t decided yet. I also have to design signage for this business, and will adapt an older sign used on my placeholder for this industry on the layout in past years. Then this building will begin to look like the core of a repackaging business! I will return to those finishing steps in a future post. But thanks again to Richard Townsend for suggesting the stucco option. I’m pleased with how it looks so far. 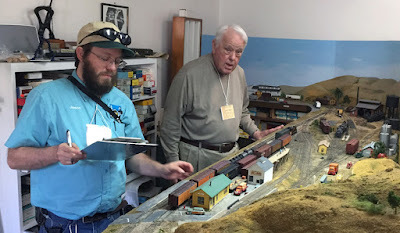 Model railroads always have to deal with space constraints, and our industries are almost always undersize, sometimes comically so. But if you Google “chemical repackagers” you will find images of a number of these businesses that do not operate out of particularly large structures. So maybe this industry on my layout, for one, isn’t as over-compressed as others. I like to think so. 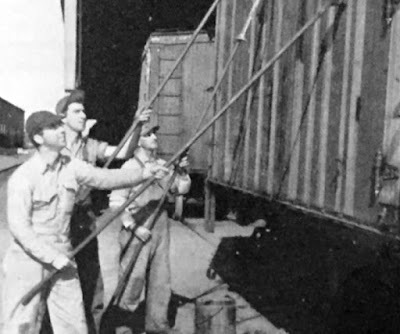 I have mentioned the practice of Pacific Fruit Express in washing its cars, until the early 1950s when their request for funds for a mechanical washer resulted in the discovery that they had been washing cars, whereupon SP President D.J. Russell demanded that they stop. Prior to that, they had been washing cars, as retired CMO Earl Hopkins put it, “just like elephants at the circus, buckets and long-handled brushes.” You can see some of the remarkable numbers of cars washed in the heyday of that practice, at the following post: http://modelingthesp.blogspot.com/2016/11/appearance-of-pfe-reefers-part-2.html , and a follow-up with more comprehensive data, at: http://modelingthesp.blogspot.com/2016/11/appearance-of-pfe-reefers-part-3.html . But in all the PFE company photography examined when PFE archives were on the way to the California State Railroad Museum (CSRM), and in searches since that time, I never could find a single photo of this washing being done. But to my surprise, when at CSRM on March 1 last week for a committee meeting, I was browsing some 1950s issues of the Southern Pacific employee’s magazine, the Bulletin, and found a story about fathers and sons who worked for the railroad. They were almost all SP employees, but two of the families turned out to work for PFE. One was named Calderon, and the other was the Smiths, father Walter and sons Eldon and Henry. Like all the family groups, they were shown at work, and the photo, taken at the PFE Roseville shop, showed them washing a car! Here it is. From left, they are Eldon, Henry and Walter Smith. The sons were apprentices in the shop, and Walter was a carman helper. No doubt this photo was posed, but it does show the tools, just as Earl Hopkins described. There is even a bucket, right in front of Walter. The Calderon family (all carman helpers) was shown at this same location, but with carmen’s tools instead of washing brushes. I was fascinated to finally find a photo of this interesting operation. I suppose this success is, in a way, a result of having the absence of the photo nag me for years. That in turn meant that alertness to such a photo was bobbing around in the back of my mind all this time. Sometimes you do eventually find something you have been wanting to find. This series of posts is about modifying a Walthers structure kit, their no. 3104, “Interstate Fuel & Oil,” to suit my layout space and also to alter some of its most distinctive features. 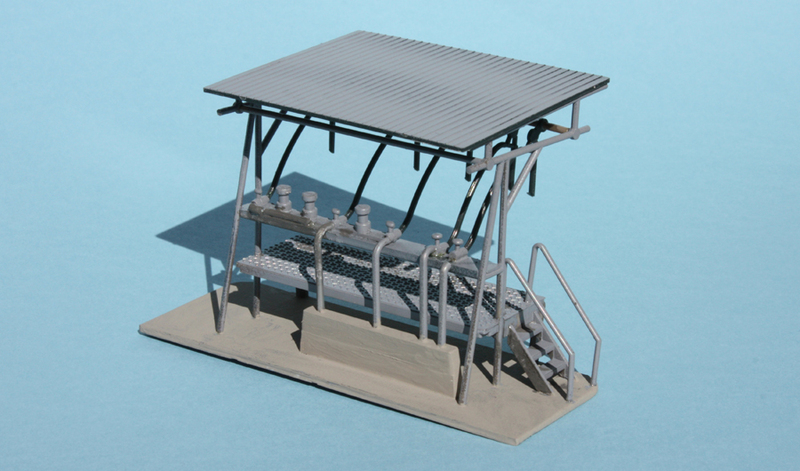 The kit is very widely seen on layouts, and I wanted to make it less recognizable and also look less “out of the box.” The previous post in the series, Part 4, contains links to the first three posts, and can be found at this link: http://modelingthesp.blogspot.com/2017/01/modifying-interstate-oil-part-4.html . In the present post, I want to wrap up this project. As I mentioned in Part 3, one segment of the kit is a very large base which supports three horizontal storage tanks and the truck loading dock. It was the wrong shape for my layout, and I divided it, first to separate the truck loading portion, then to reduce the number of horizontal tanks to two. (Part 3 can be seen here: http://modelingthesp.blogspot.com/2017/01/modifying-interstate-oil-part-3.html .) That left the separated parts to be completed. First I finished the truck loading dock. This was largely built stock, but since my kit components can’t be positioned as intended in the kit, I decided I could not use all the kit piping. That in turn meant I had to figure out how to provide delivery piping to the truck dock. I used some of the kit pipe segments, fitted to work with a support block of concrete. The base for the dock was also painted a concrete color, to suggest a concrete pad under the structure. And I felt that the black color of the kit’s truck dock roof was too stark, so painted it the same gray as the other parts. Here’s a back view. Second, as I showed in Part 3 (link in the second paragraph from the top of this post), I found the huge “weld seams” or joint seams on the tankage to be very out of scale, and simply applied a file to all of them before I assembled the tank segments. 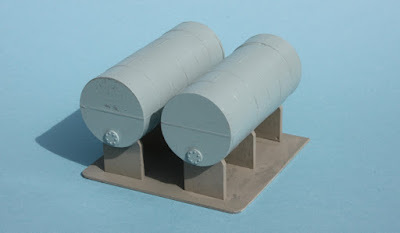 Once assembled, I painted the tanks with Tamiya “Corsa Gray,” their color no. PS-32. The base for all the horizontal tanks was painted a concrete color. In this photo, they still need to be weathered. Third, I decided to make the vertical tanks for the kit a little shorter than what the kit directions suggest. 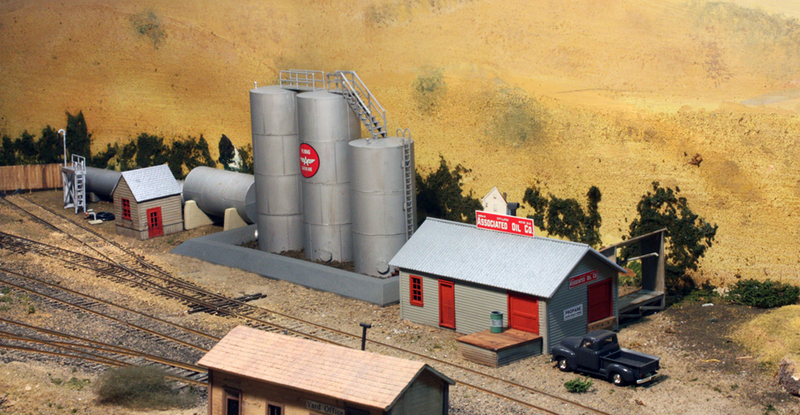 That’s because the location of this Richfield dealership on my layout is such that tall tanks could obscure the track that runs behind the tanks. Note below that I used two styles of top vents. 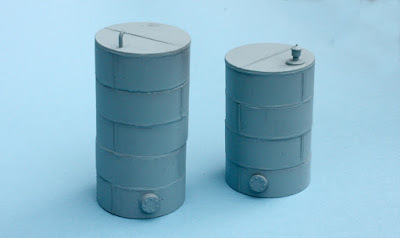 These tanks are also “Corsa Gray,” and also remain to be weathered. These are considerably smaller than the tanks suggested in the kit instructions, which are seven segments high instead of four or five. But even the four-segment tank is a scale size of more than 13,000 gallons (each segment is about 3300 gallons), so neither of these is really a small tank (and both are larger than a transition-era tank car). Richfield’s gravity unloading facility will be in front of the two horizontal tanks, with the pump house alongside. 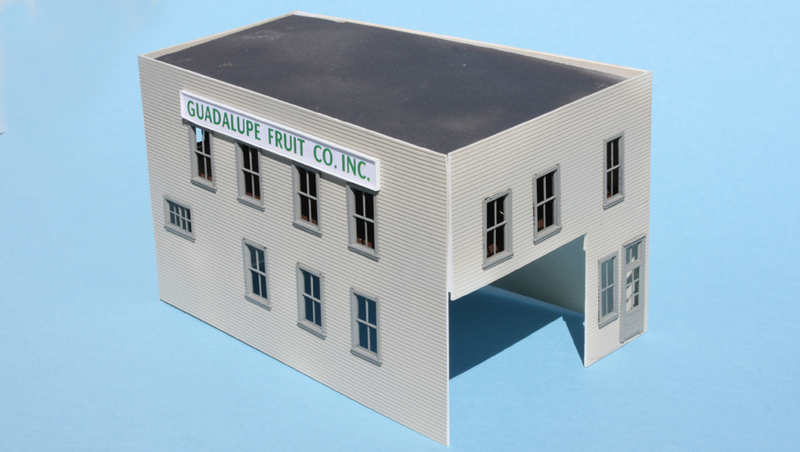 At right is the corner of the Coastal Citrus Association, a lemon packing house on the same spur, which has a PFE car spotted for loading. 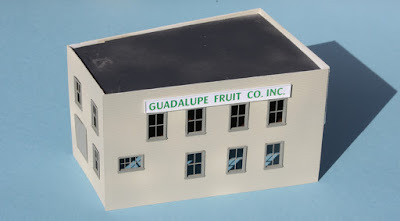 The modifications I have made to this kit worked out as I planned, with what I feel is successful replacement of the kit’s distinctive round warehouse roof and the equally distinctive heavily ribbed tanks. 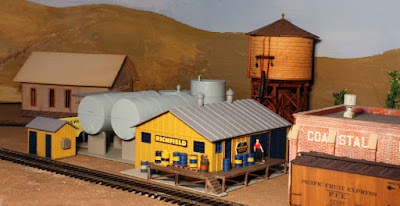 And although the entire arrangement on the layout of the elements in this bulk oil dealership are not finalized, I have all the parts completed, and will experiment a while longer until I am convinced I have the best arrangement for my space. But I’m glad to get this far with my Richfield dealership. I am among those who prefer that track switches be thrown as on the prototype, namely by hand in most cases. I am also among those who has installed switch machines in the past and then had to cope with maintenance and adjustment from time to time, along with occasional failure of the switch machine. The use of Caboose Industries ground throws is extremely common in HO scale (though they are awfully large, in fact out of scale even in S scale), and I have some too. But one has to recognize their virtue, that they are robust and dependable, and easy to operate. 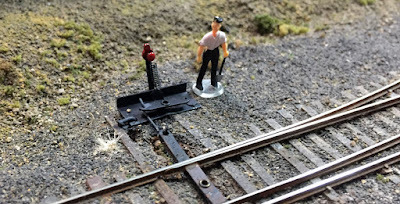 I have occasionally heard the comment, that the Caboose Industries ground throws are “not that oversize.” Here is a Jim Shaughnessy photo (courtesy Clark Bauer) of a brakeman throwing a prototype ground throw.Since his foot is on the head block, we get a good measure. You can see that the throw bar is just about knee high, which matches my recollections. Now here is an HO scale man posed next to a Caboose Industries throw. I will repeat my previous comment, these throws really are too large even for S scale. And my concern is not only the throwbar length, as you see in the photo above, but the sheer size of the mechanism, almost waist high on the man. That is why some of us are interested in alternatives. I have discussed before that I really like and am using the fine ground throws from Bitter Creek (see them at: http://www.bittercreekmodels.com/page11.html ), and have been installing them wherever a new ground throw is needed, along with replacing some of the Caboose Industries throws already installed (see my post at: http://modelingthesp.blogspot.com/2012/09/electrical-wars-part-3-hand-throws.html ). 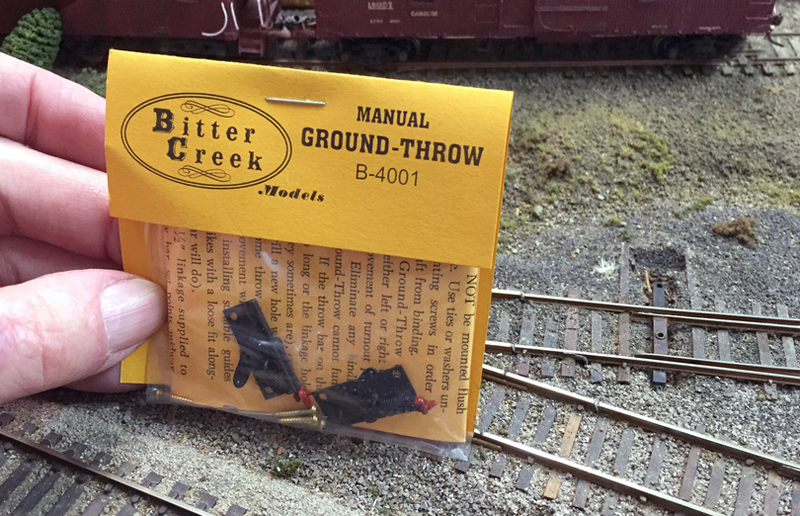 I use their model B-4001, Manual Ground Throw, and it is very much as easy to install as the Caboose Industries part. I continue to install these, and operators visiting on the layout seem to like them as much as I do. The turnout shown in the model photo above was a candidate for replacement. In the next photo, I’m holding a package of Bitter Creek throws (they come two to a package) next to the turnout, from which the Caboose Industries throw has been removed. The operating lever of the Bitter Creek throw is not greatly shorter than that of the Caboose Industries throw, as you see below, though it is more slender. This is the same turnout shown above, after Bitter Creek replacement. More important to me, the mechanism of the Bitter Creek throw is far less intrusive, as you can seen with a thrown mechanism in the photo below. But there can be an issue. Any switch well away from the front or aisle edge of the layout can be a little less satisfactory for manipulating the Bitter Creek throws, while the oversize Caboose Industries throw is easier to use at a distance. Accordingly, I am rethinking my locations for ground throws, and have been removing Bitter Creek throws that have been installed at the back of the layout, and replacing a few of them with Caboose Industries throws (of which I have a surplus, having previously replaced many of them with Bitter Creeks). Meanwhile, I continue to pull up Caboose Industries throws near the front of the layout, in favor of installing Bitter Creek throws, as in the case of the turnout shown above. Are there alternatives other than hand throws like the Bitter Creek? Many would just go with switch machines, but that isn’t me. The other obvious alternative is some kind of long-range manual throw, whether with a long rod, a cable, or some kind of linkage. I have a couple of these on my layout, but not every location lends itself to them. So continuing to use Caboose Industries ground throws at the back of my layout, though obviously a compromise, is one I am all right with. Bottom line: any place operators have easy access to a ground throw, I’m installing Bitter Creek throws. The Caboose Industries throws are only used in places that are not as easy to reach. They are still a little easier to operate. But that’s the only reason they will survive on my layout.